As security management becomes more integrated into business processes, it’s commonly seen as closely related to risk management. This is an accurate perspective, as security professionals position controls as ways to mitigate negative business events. But risk seen in this way is often used as a monolithic tool used to hammer home reasons why executive management should spend more money on security. Risk is actually an aggregate of many smaller factors which must be addressed if the business is to be adequately protected. These smaller factors are often without cost in real dollars, and fixing them is a prerequisite for implementing more advanced controls. My take on risk is a little different from what you might be used to seeing. I first start with a standard formulaic model and expand a little, as shown below. Threats are pretty easy to understand when viewed in terms of all the ways people, malware in the wild, and nature can ruin a perfectly peaceful afternoon. We’ll cover vulnerabilities later. Target Value is defined in terms of either it’s criticality to the business or its sensitivity. Sensitive systems and data typically include intellectual property, PII, or ePHI. Finally, Response is a measure of how well an organization can detect, identify, contain a threat and recover from a security incident. As shown in the formula, the effectiveness of an organization’s response directly impacts its overall risk. This is all very interesting, and it should be pretty familiar to most of you. But there is another way of looking at risk which helps identify fundamental weaknesses in a security framework. The layered risk model is something I use to identify the small things I may have overlooked. It’s important to fix all the little things, things which taken all together can lower the ROI gained from implementation of sophisticated layered controls. In this diagram, risk is depicted as an aggregate of factors contained within four layers. Each layer has its own level of risk, depending on how well elements within it are managed and what controls might be in place. Although all are important, I’m focusing on the second layer (from the bottom) for the rest of this article. For more information about the other risk factors, see A Practical Approach to Managing Information System Risk. 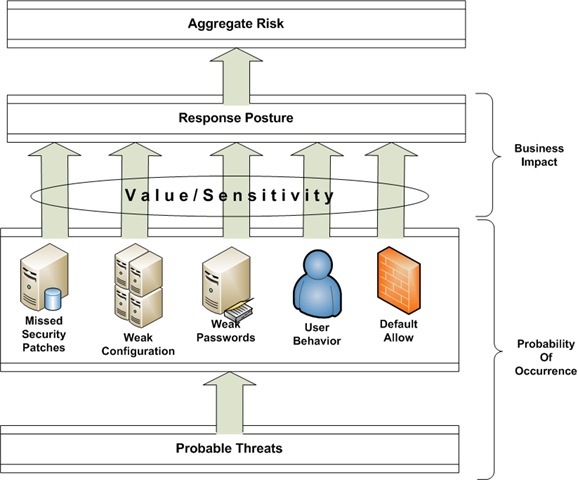 Since threats and vulnerabilities together comprise Probability of Occurrence, adjustment of either reduces the possibility of a successful attack. We have little control over threats, so vulnerability management is our best option. As you can see from this example, vulnerabilities exist in many forms. In this particular model, I listed some basic security holes which I call the “little stuff.” Little stuff in the sense each by itself may be a small vulnerability and is something which is easily addressed. Together, however, they form a formidable vulnerability layer, easily exploitable by the right attacker. They are also easily avoided by following fundamental security best practices. As the title of this piece infers, tightening a few screws–paying attention to the little stuff–can strengthen your overall control framework. Once the wobbling ends, you can achieve a better understanding of actual gaps. For years, large businesses have spent millions to improve information security. Much of this expense was driven by regulation or fear of public relations issues. As security around large networks and data repositories improved, however, many small and medium business (SMB) managers didn’t feel the need to spend money on security. After all, only large targets get hit. Why should they care? The reason SMBs should care is simple. They are typically softer targets than their big brothers. As large organizations–once easy pickings for business-minded cyber-criminals–strengthened their defenses, the cost associated with unlawfully obtaining valuable information from them increased. Along with cost increases there was also growing probability of being detected and arrested. So criminals had to look for less expensive targets with lower personal risk. They often found them among SMBs.